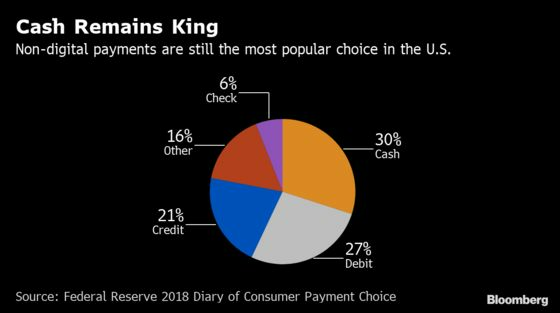 (Bloomberg) -- A mounting backlash against cashless stores isn’t slowing growth in the $95 trillion payments industry. Even as some U.S. cities seek to protect low-income consumers by barring stores and restaurants from shunning physical currency, digital payments are building acceptance around the world. A Citigroup Inc. index that measures the readiness of 84 countries to adopt electronic payments has increased 5.5 percent in the past five years, the bank said in a report this week. Sloan’s company is one of many that have benefited as countries encourage electronic payments to better track the flow of money inside their borders and collect more taxes. A 10 percent increase in the adoption of digital money would result in a $150 billion boost to consumer spending, Citigroup found. Governments, meanwhile, would pocket $100 billion more in incremental taxes with increased payment digitization. The movement away from cash has proven a boon for payments companies. 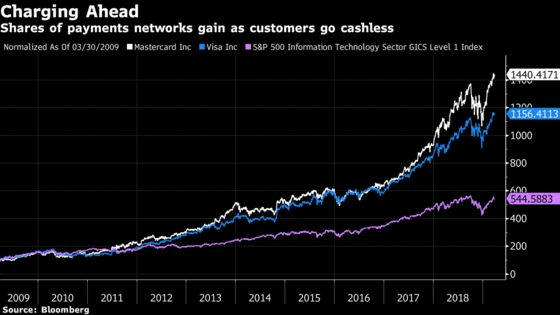 Mastercard Inc. shares have gained 38 percent in the past year, and Visa Inc. is up 32 percent, compared with a 15 percent increase in the S&P 500 Information Technology Index. The payments networks are each up more than 1,000 percent over the past decade, more than double the information tech index and triple the S&P 500. But in the U.S., politicians warn that the trend will marginalize disadvantaged residents -- those lacking the means to maintain a bank account or without access to electronic payments, a market that’s been estimated to be worth $95 trillion globally. In February, Philadelphia prohibited discrimination against customers who want to use cash, and lawmakers in San Francisco and New York are considering similar measures. The backlash has sparked warnings from companies including Amazon.com Inc. The retailing giant told Philadelphia city officials that it wouldn’t bring its Amazon Go stores, which don’t have cashiers, to the area if they passed the law banning cashless stores. The conflict is in its early days: The vast majority of stores and restaurants around the U.S. still accept physical currency, and cash continues to be the most common payment method in the nation, representing 30 percent of all transactions, according to a 2018 Federal Reserve study. For in-person transactions, cash use is closer to 39 percent, the central bank found. Indeed, the use of cash remains high around the world. At Western Union Co., the world’s largest money-transfer business, most transactions are still paid in cash, CEO Hikmet Ersek said.